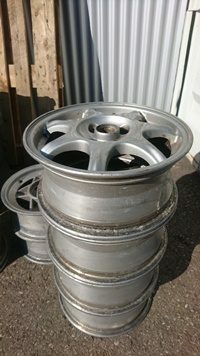 I am selling some Enkei hollow spoke wheels in good original condition. One wheel weights just incredible 4kg!! Volkswagen, Opel, volvo and many more. beacause of their incredible light weight they will suite very well for motorsport applications. I am able to rework them and make a nice new finish in your requested colour if you like to.